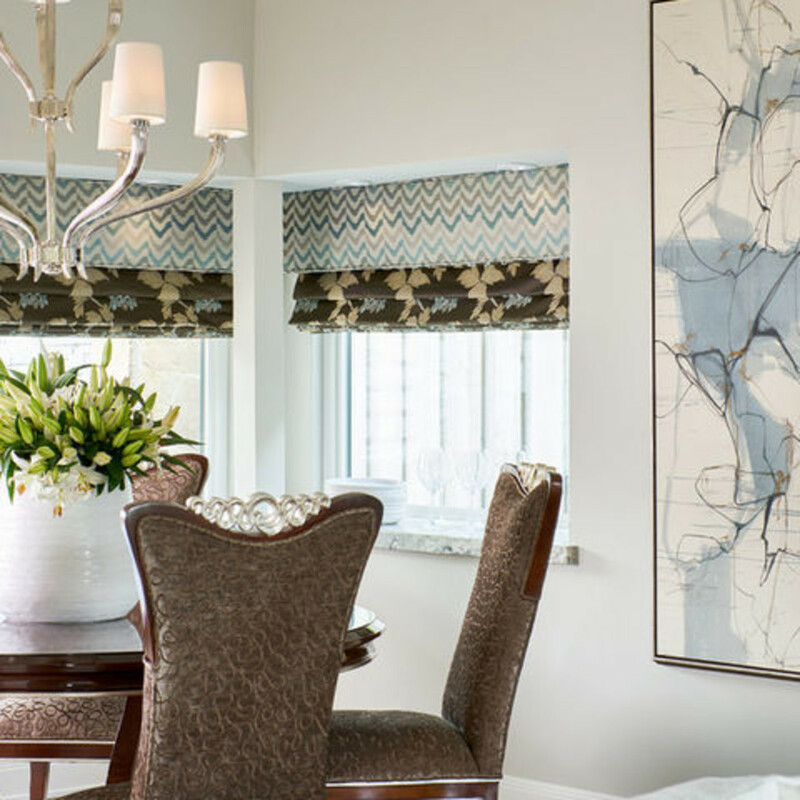 After her husband passed away, this Dallas homeowner, a hip, fashion-forward woman in her 50s, had a decision to make: Should she sell the beautiful home she and her husband had both loved or freshen it up with a remodel? Designer Carl Lowery of Wesley-Wayne Interiors had worked with her on small touch-ups here and there since her husband’s passing, but when she decided to stay in the home where her memories were, Lowery gave her the opportunity to preserve her husband’s memory while ushering in a new chapter with lighter furnishings that felt more like her. 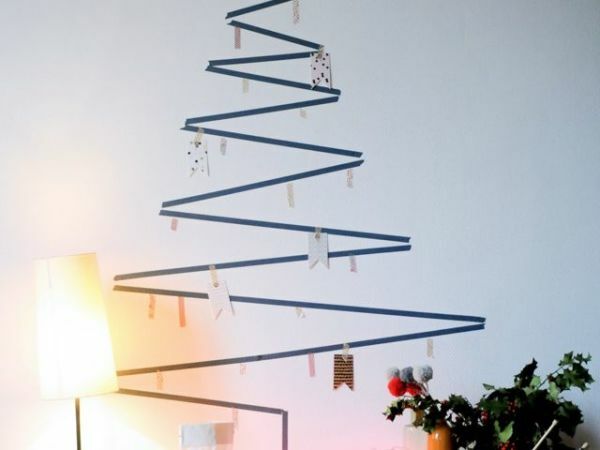 The homeowner’s husband had always hated their cramped staircase, which felt even tighter due to the dark, heavily textured walls that pervaded the home. So designer Lowery’s crew widened the hall by about 16 inches but left the rest of the home’s floor plan as it was. 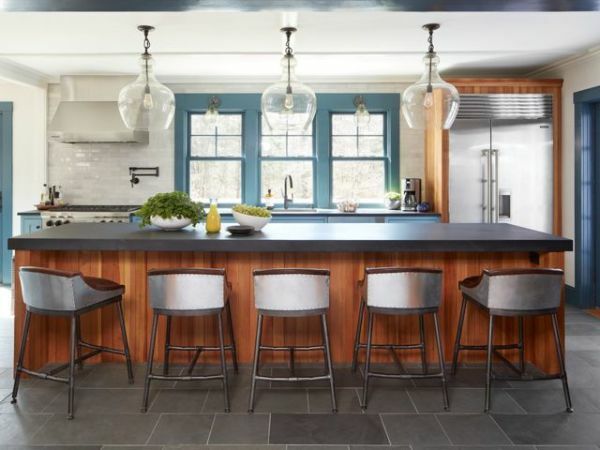 All of the surface finishes and furnishings, however, were completely overhauled. The floors were stained with a custom blend that helps to scatter the light from the front door and entry windows into the hall. 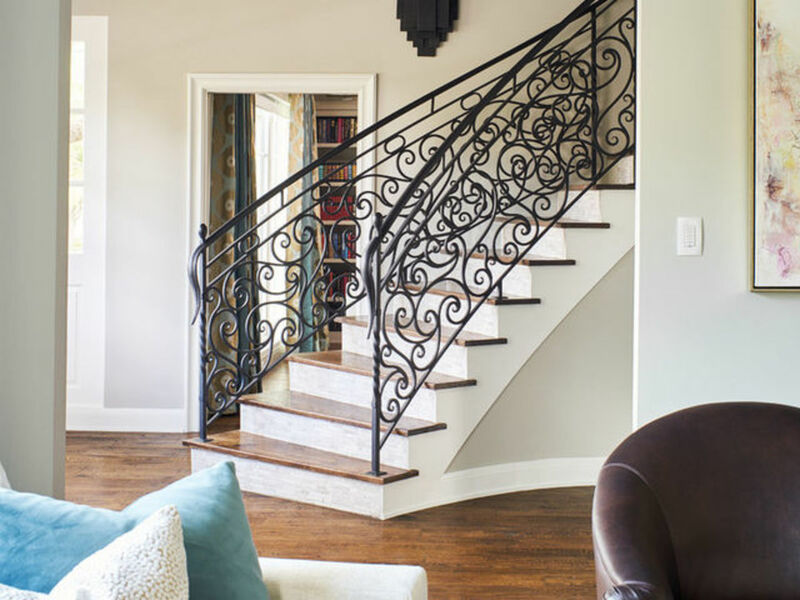 The iron banister, a custom design, is the real focal point of this area and adds a sculptural element to the space. 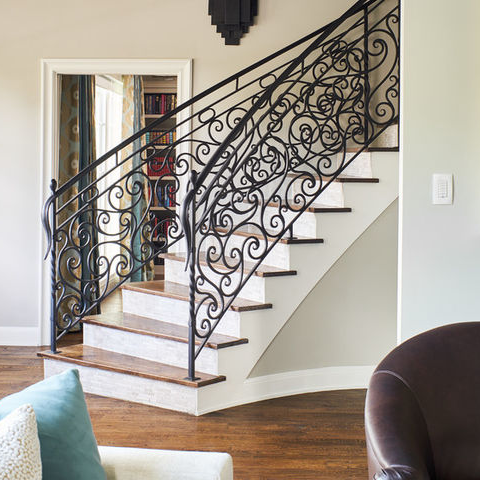 Just down the hall are some of the homeowner’s special finds that have finally found their place in her home. She had bought the bookcases several years before and promptly put them in storage because she didn’t quite have a place for them. With the expanded entry hall came an opportunity to put the pieces to practical use, housing objets d’art and necessities like keys and mail. The living room, which opens to the foyer, serves primarily as a formal entertaining space but also provides overflow seating for watching ballgames on TV when the more casual upstairs lounge is full. 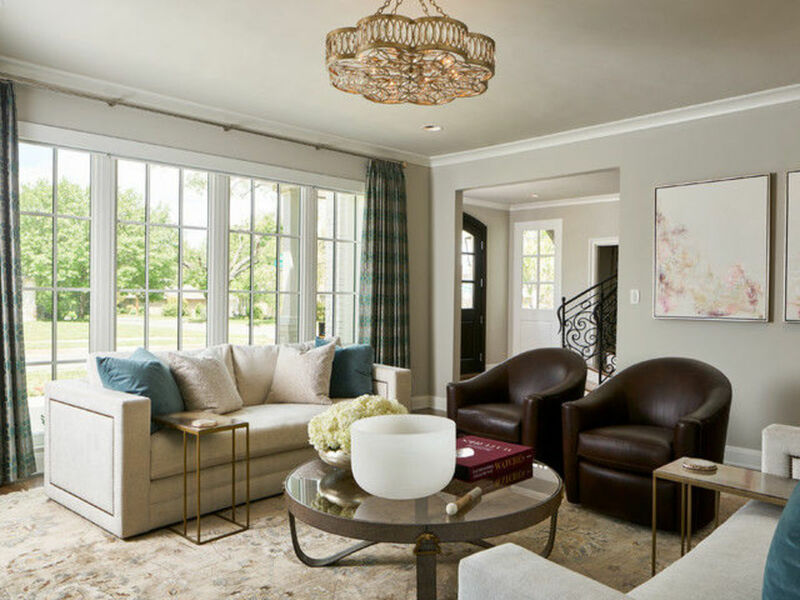 The artwork was plucked from the client’s collection and is one contrast among many in the room: The abstract forms feel ultra cool among the plush furnishings, which themselves merge rich leather and white upholstery through coordinated nailheads dotting the sofa. 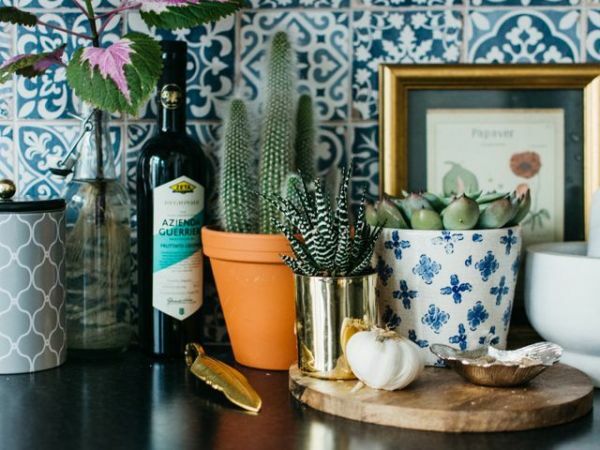 The dining room is all about subtle glitz. Much like the wood floors in the foyer, the dining table’s French polish treatment reflects all that natural light from the windows. 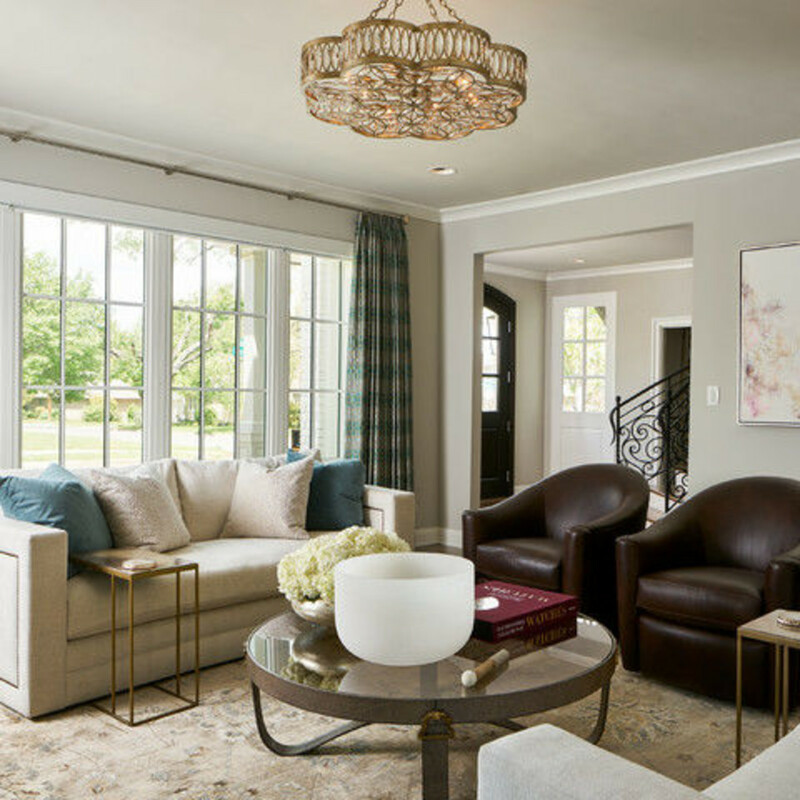 A gold-leafed mirror, silver leafing on the table and chairs, and a polished nickel chandelier help this room walk the line between classic and contemporary. The room’s unique window architecture also called for thoughtful window dressing: Both windows sit within bump-outs that hang over and outside of the house. 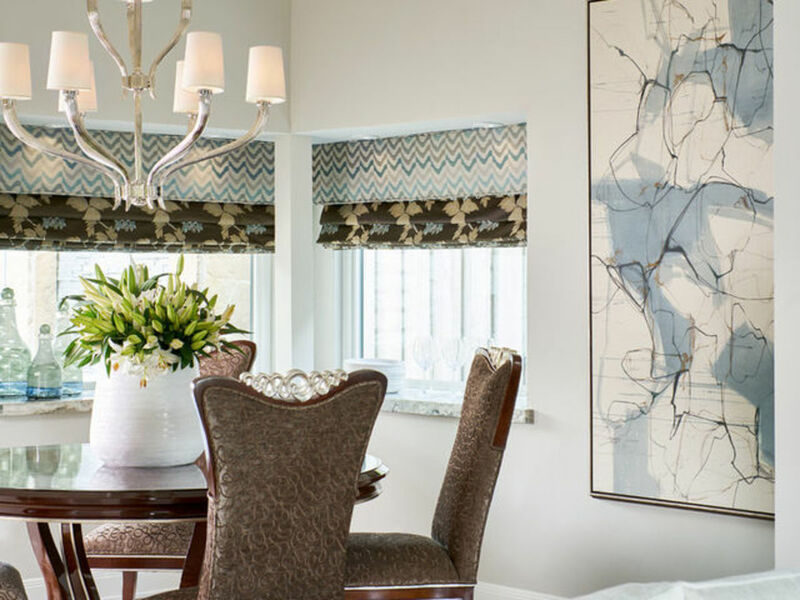 Lowery wanted to install something visually interesting here to showcase the window boxes without making it look too busy, so he took advantage of the mounting depth and hung Roman shades beneath cornices in a contrasting fabric. The homeowner’s husband’s former library has now become her office, and it’s filled with reminders of him. Where there used to be a pool table and a bar there are now multiple bookcases that cradle his legal texts and her own large collection of books. 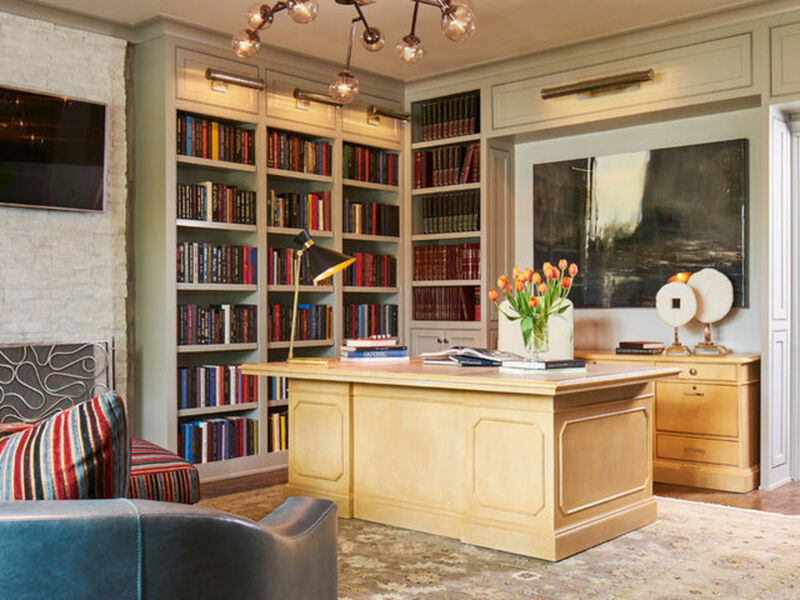 Lowery created “as many bookshelves as possible on almost every wall” and, among them, carved out a place behind his refinished desk for the husband’s old credenza. The striped fabric on the pillows and ottoman was chosen not only because it tied in well with the rug, chairs, and draperies, but because it mimics the spines of the legal volumes. For the fireplace, Lowery used split-face stone and contemporized the whole scene with an unexpected light fixture. 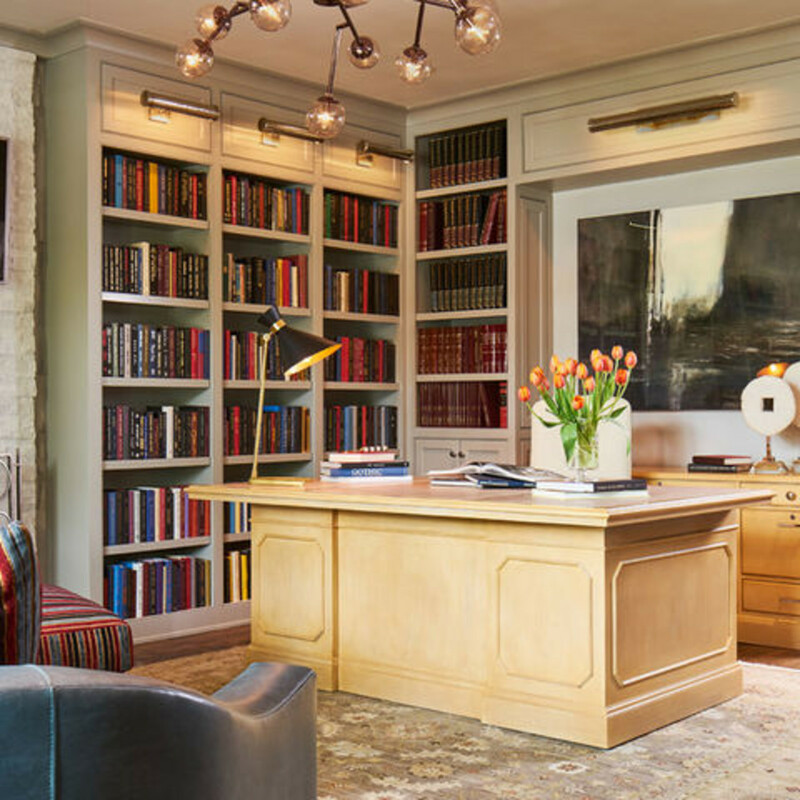 Hammered silver picture lights shine down onto the bookcases, creating a true library feel. 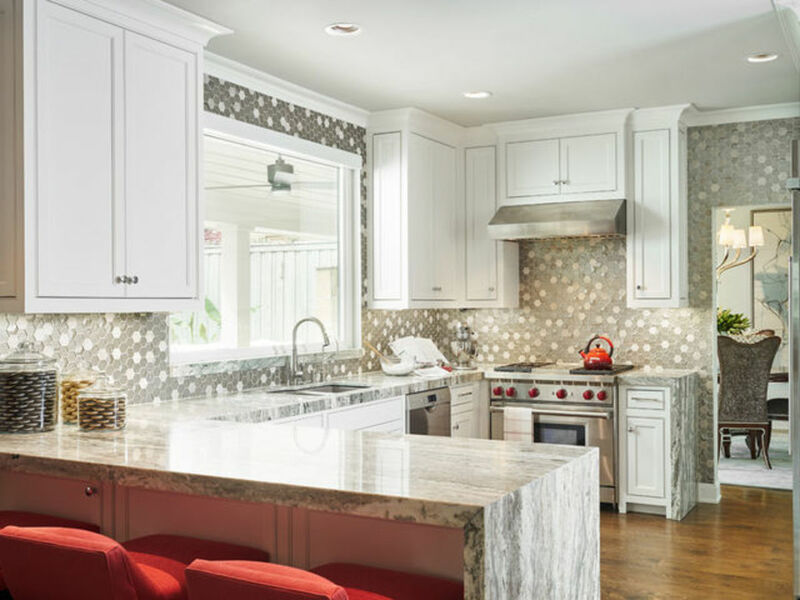 In keeping with the overall lightening and brightening of the home, Lowery reframed the kitchen windows to bring in more natural light and “make the metallic finishes sparkle.” White cabinetry keeps a clean and crisp feel, while floor-to-ceiling mosaic tile work gives the room a magical quality that is fun and friendly. 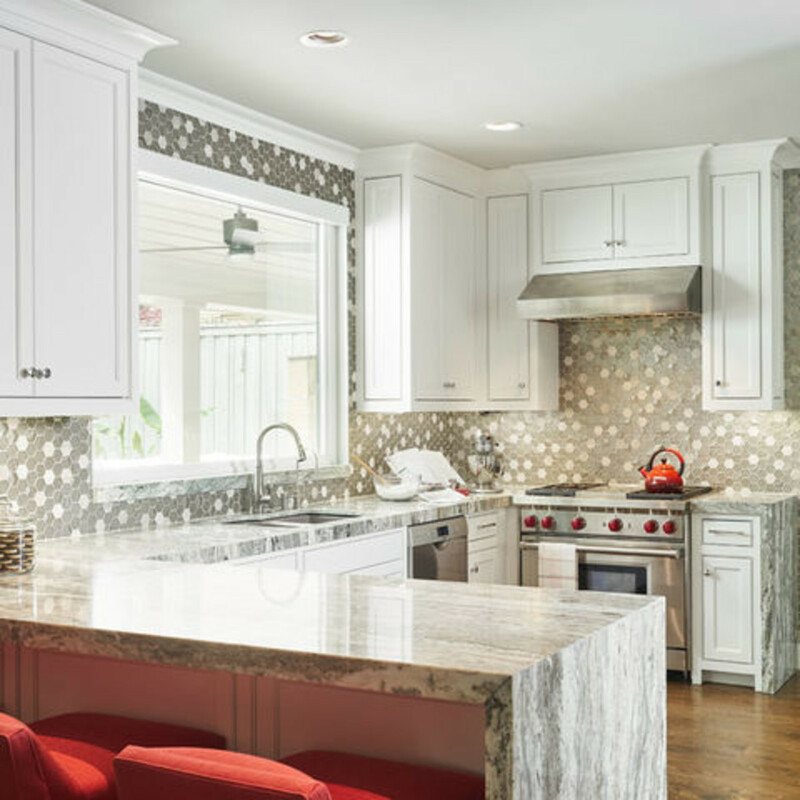 Neutral cabinetry and tiling in the kitchen invited the designer to inject color in other ways. In the breakfast room, Lowery designed a custom banquette in two fabrics: a wipeable cream leather for the seats and a lush red and orange velvet geometric pattern that ties in with the red bar stools in the kitchen and the knobs on the stove. Above the whole setting is a gallery wall of the client’s personal photography taken on vacation with her husband. Sleeping alone can be one of the harder adjustments after a loved one’s passing, so Lowery worked hard to design a space that would comfort and soothe his client in this next chapter of her life. The new master bedroom has become her primary space of refuge when she’s relaxing at home. The chandelier, which is “reminiscent of bubbling champagne,” Lowery says, isn’t the only glamorous touch here: The tufted velvet headboard is like a comforting hug at the end of the day. A palette of warm neutrals in the master bedroom provide a sophisticated backdrop for the fun pops of fuchsia and pink that were plucked straight from a large piece of original artwork from the client’s collection. A former bedroom is now an entire room dedicated to a massive collection of Barbie dolls. The designer couldn’t even guess at how many she has: She’s collected them all her life and has “so many more than we could ever possibly display, probably thousands,” Lowery says.